I guess I was being naive. Maybe I didn’t do a good enough job at preparing myself for my first visit to Knotts Berry Farm. No, I’m not talking about looking at a park map or figuring out what rides we should do first, but I should have done a better job at trying to get an understanding of what kind of theme park Knotts Berry Farm is. As we pulled of the 91 Freeway into Buena Park, I could see the giant wooden coaster Ghost Rider looming in the distance. For the last 4 years almost all of my theme park visits have been to Universal or Disney resorts. Abandoning my Midwestern roller coaster roots, I’ve grown used to high theming, dark rides, and coasters that soar no higher than a paltry 200 feet. Walking into Knotts I had a mind full of presumptions and expectations that I had already, unfairly, laid on this historic park. What I would experience over the next six hours was a mixture of thrills, confusion, and whimsy. The first impression walking into Knotts is that there is no first impression. While it was a welcome relief to not have to hop on a tram, monorail, or bus to make it from our car to the front gate (the walk took all of about 5 minutes), it was striking to see that there was no grand marque in front of the park. The main entrance is so timidly marked, we had to blindly guess at which direction to go. I was expecting some giant WELCOME TO KNOTTS BERRY FARM type of signage to beckon us to the front gate. Getting in the park may have been the easier than ordering a “double double” from In and Out. The simple receipt ticket with a barcode on it made entry easy, and the fact that there was only person ahead of us at the entry gate made the process smooth as could be. Having just landed from a six hour plane flight I called up Rick West from Theme Park Adventure and asked him where we could get a quick lunch. I was starving. Without hesitation, Rick ordered us to visit the Ghost Town Grill. Upon entering Ghost Town, one thing was clear; Halloween is here! Special Halloween decorations as far as the eye could see. As if this historic area of the park didn’t look good enough (it was the original “themed land” of the park), Halloween decorations are placed all around you. Walking down Main Street in Ghost Town, you are surrounded by giant spiders on building, rats on roofs, and skeletons were littered throughout the land; each with their own story to tell. The absolute magnitude of the decorations had me reeling. The details, the amount of decorations, and the care that went into placing in funny positions was amazing. No two skeletons are the same. Different costumes, different set pieces, different stories. This was truly a treat for the eyes. As I walked through Ghost Town, my eyes wrestling my brain trying to look at all the directions and trying to find the Ghost Town Grill, bluegrass versions of contemporary songs were being played over speakers in the land. I later learned of the move by then new Knotts general manager, Raffi Karprelyan, to play upbeat Top 40 type music in Ghost Town to keep crowds energetic. Imagine walking though Frontierland and hearing Lady Gaga. Needless to say, faithful Knotts fans soon made it known that they did not approve of the music. We were greeted by a wide eyed friendly greeter at Ghost Town Grill who showed us to our table. Walking through the restaurant on the way to our outdoor patio table, I noticed something odd. Every table in the restaurant was empty. It was right around noon, and my mind immediately began drawing comparisons to how difficult it is to find a table at a sit down restaurant at a Disney Park. Our table was positioned right a alongside Main Street that looked like it belonged in a real Ghost Town. With the exception of the occasional family, traffic in this area was not existent. I wondered aloud if this was because most of the local crowd was still at work…? Again, coming from the Orlando parks, even on a slow day you can expect some type of crowd no matter where in a park you go. After a short time our meal arrived; a chili cheeseburger for me and a Frisco burger for Daniel. The food was pretty good for “theme park food”. I could tell it was made fresh to order and wasn’t sitting under a heat lamp for the last two hours. The price was reasonable also. 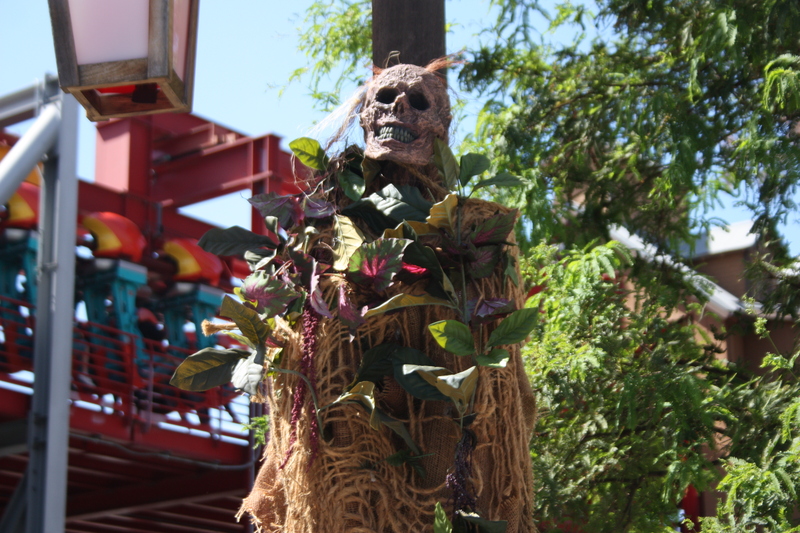 We made our way through the Fiesta Village area we saw some special Halloween decoration. Special Dia de los Muertos skeletons and bodies have been set up. Colorful, lively, and vibrant, the skeletons brought a much needed energy to this part of the park. As I looked around this land I noticed a certain messiness to it that was confusing and disorienting. Even though the land was filled with bright colors, there didn’t seem to be any order or care taken; just noise for your eyes. We walked through the land and ran into the now defunct Winderseeker (long story, don’t ask). Rick continued to lead us around the park and talk about the Knotts history and the comings and goings of attractions like the Blacklight Jesus (long story, don’t ask). We walked though Camp Snoopy, an under themed land filled with off the shelf rides that even most of the kids in the park today didn’t even want to bother with. As Hawaiian Roller Coaster Ride from the Disney film LIlo and Stitch played over head (yup), I simply shook my head and pleased with Rick to lead us out of the land at a faster pace. As we hit the edge of the land Rick turned to me and smiled and said, “We have to ride this!” I looked up and saw Sierra Sidewinder; a coaster that seats 4 people back to back. The cars spin as the circular ride vehicles race down hills and turn corners at fast speeds and tilt riders at a near 90 degree angle. All of those elements are fine, except for one. I cant spin. I start to get motion sickness and it doesn’t get any better after that. As we neared the load platform, Rick’s grin got wider and my dread grew by the second. The next 30 seconds was filled with my holding the lap bar until my knuckles turned white and me screaming nothing but bad words into Rick’s ear. The ride was great, but put this ride in the same box as Mickey’s Fun Wheel; I did it once and will never do it again! Reaching the back of the park we found ourselves in front of the Calico Mine Train Ride. This is Knotts history. This is one of the signature rides that helped put Knotts on the map. The look of the ride is very reminiscent of Big Thunder Mountain. The cast member at the front of the train added a great deal of nostalgia as he led us through the mine. It was charming and you can clearly see where Disney Imagineeers got their inspiration from. After the Mine Train we walked across the way to Timber Mountain Log Ride. Just like the Mine Train, the Log Ride was charming and was a bit like walking back in time. The wonderful AA figures that populate the ride really helped bring it to life. Anyone who rides this can immediately draw the comparisons to Splash Mountain. I was more than impressed with this side of the park, but once again, as we exited the Log Ride, we are greeted by an off the shelf swing ride that flings guests back and forth. It wasn’t themed, and had no business being this close to such classic attractions. Whats more, the ride is an extra $5 to ride. It just didn’t belong. It felt like I was at the local county fair and found myself reaching in my pockets to find 3 tickets to go ride the next attraction. The frustration continued as we reached the edge of Ghost Town and saw a small themed cemetery. Cute, and funny, the headstones each had something on them (Haunted Mansion graveyard…?). You can walk through the cemetery, take pictures, and marvel at the detail (the detail in Ghost Town is amazing! The kind of detail you see at Disney, and in some cases, better!). Very nice, but then all of a sudden… BAM! Steel supports for a small coaster intrude on the immediate area around the cemetery. Why? Who put this coaster here?! And why?! It just ruins the immersive atmosphere of this charming cemetery. I couldn’t even get a good shot of the cemetery with having a steel support beam creep into my camera frame. I was over it. This is Knotts Berry Farm in a nutshell; great theming that is ruined by loud coasters that creep into the guests’ experience. There is nothing wrong with having large, loud, fun coasters but as soon as you begin to buy into a story in a land, especially Ghost Town, you are violently (at times) yanked out of the fantasy world and reminded you are in a concrete jungle filled with twisted metal and steel coaster supports. Knotts has undergone some recent changes in leadership, and its parent company, Cedar Fair, is still struggling between trying to maintain the classic look and feel of the park and still try to draw today’s modern iPad toting family. The question is, can a balance be found? Can Cedar Fair bring thrills to families while still providing immersive entertainment? Ghost Town is the crown jewel of the park and needs to be preserved. The little details and nooks and crannies really remind you of what a good theme park should be. Don’t get me wrong, I love super tall, fast, and twisting coasters as much as the next guy, but not at the expense of ruing highly themed environments. Anyone walking around Knotts can tell that there is a struggle going on; an identity crisis. Beautiful lands like Ghost Town and charming rides like the Mine Train and Log Ride are fighting an epic battle with mega coasters like Silver Bullet and Xcelerator. This identity crisis is going to take a lot of hard work and creative thinking to fix. The years of changing leadership, and shifting focus has led to a Knotts that, while entertaining, is struggling to hold onto what made it great. Maybe we shouldn’t hold Knotts up to the “Disney Standard”. 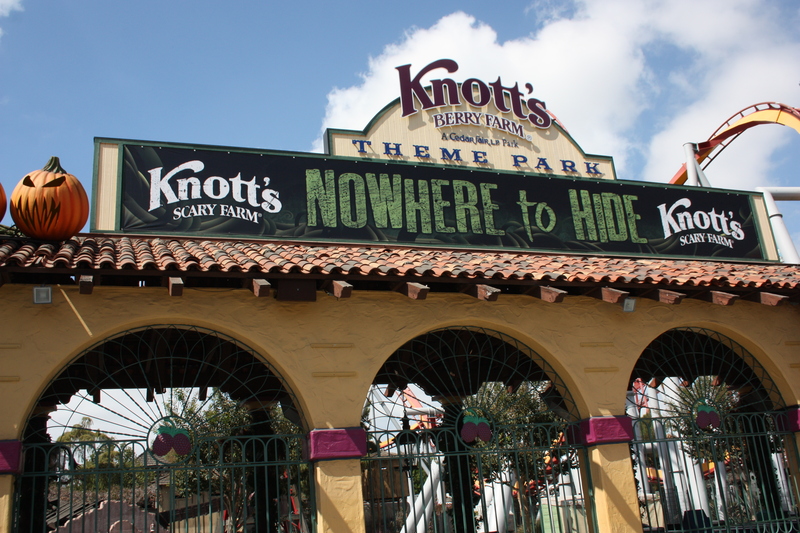 Maybe Knotts is just an amusement park like Cedar Point and not a theme park. I’m not saying I walked away unimpressed or underwhelmed. I ended my day at Knotts with a smile on my face. I was entertained, and confused. Thrilled and frustrated. I was feeling nostalgic about the past, and curious about the future of Knotts Berry Farm. So Chris you finally got your taste of Knots. 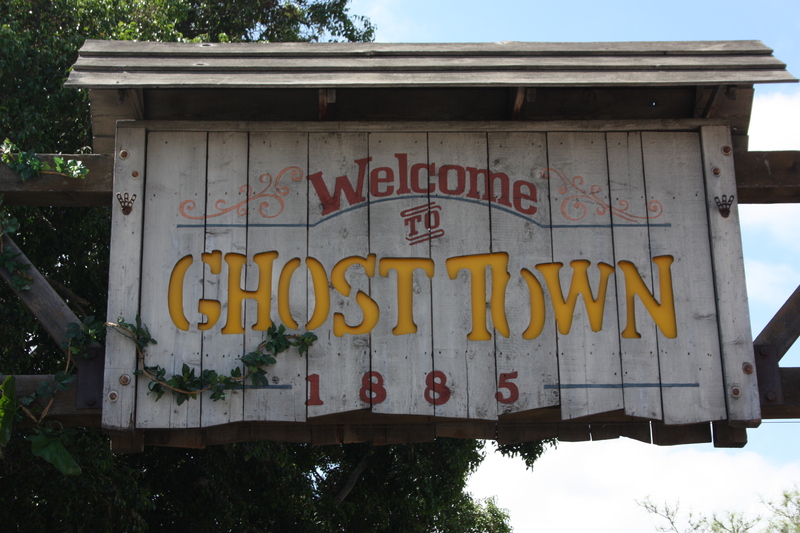 I bet you did not know but right around the time of change in management they were designing a coaster that would have required them to rip Ghost Town completely out of the park and when the new managers got in there they put a stop to that. The park is right now in a transition phase and it would be interesting to see what the park looks like within then next 10 years as more and more family attractions go in and some of the old steal goes out. In the very back of the park what they did was they ripped out Perilous plunge (flume ride) and added Coast Rider and 2 family rides. 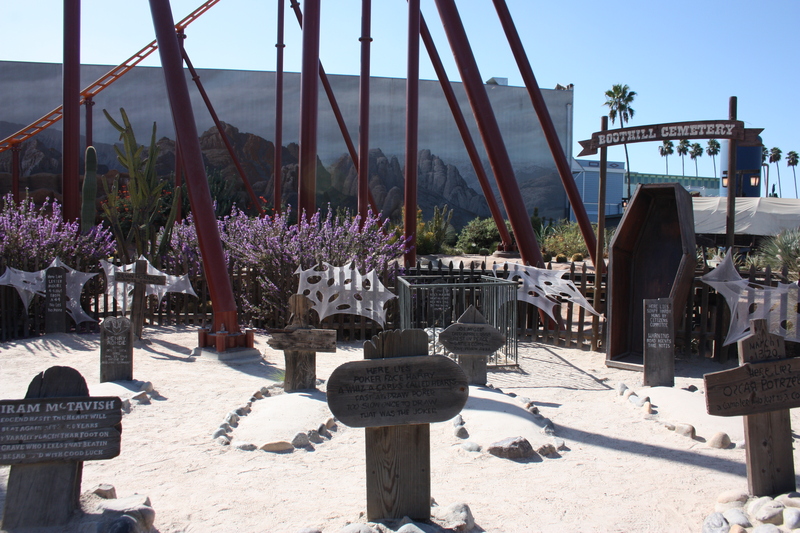 One of those ride were taken out previously when the decided to build the Pony Express coaster (the ride that you saw only steel beams in the grave yard). This shows the new dedication by the management towards improving the park and preserving its history.